Of all the things I’m afraid of, I’m grateful it is not heights. 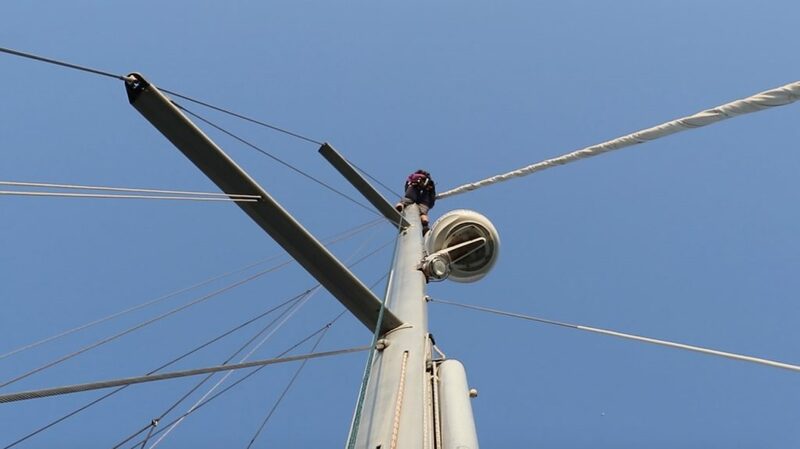 Today I went up the mast to replace the rotavecta and to re-attach the line for the flag that had come off some time ago. We are getting ready to leave Morocco and sail to the Canary Islands tomorrow, teaming up with fellow Dutch kid boat Hera, on an approximately 500 mile crossing. After the hustle and bustle of Morocco and its stunning landscapes (and very friendly people! ), I feel a little bit apprehensive to be out on sea for a multiday crossing, but I’m also looking forward to it. Time for new places and new adventures! As soon as I’m back in range of decent wifi I’ll continue my blog series on our road trip inland (part 4 and our entire itinerary coming up!) and maybe even get some editing done for another video. Who knows. (Editing is a lot of work you guys and I’m very finicky). First things first: checking out of the country and enjoying the vast blue sea until we’ll reach land again. Want to see where we are?